If you haven't had the chance to see Sony BRAVIA's ad yet, you can and should. It's fresh, quiet, just beautiful; the idea is very simple, while challenging, it takes place in a splendid city, and the music—a cover of Heartbeats, from José González—plays a huge part as well. To highlight this ad, they've created a clean website—without too much re their corresponding products—, where you'll also find a making of and a bunch of other stuff (like desktop pictures, screen savers, etc.) Moreover, it's featuring MPEG-4 Part 10 (a.k.a. H.264) materials—requiring Apple QuickTime 7—, which means quality. Good job! Udpate: And for those who have access to broadband, an extended version is available here. Enjoy! I too think that Daring Fireball's post of today does a very good job in analysing the situation. And here's what I consider the best part of it… at least, for the next round ;) ! "This is a move of supreme confidence—Apple relishes the comparison between Mac OS X and Windows XP, and Microsoft has shown enough of Vista via its widely-available beta seeds that Apple quite obviously isn’t afraid of that comparison, either." 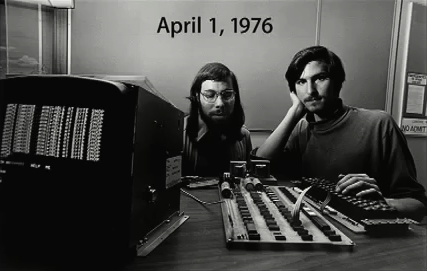 Today, Apple is 30 years old. So Happy Birthday, Apple! Thanks for the journey so far. And may the next 30 years be as exciting as the previous ones ;) !